HSBTE Result 2019 Nov, Dec Exam 2018 Haryana State Board of Technical Education Result for Nov Dec 2018 will be announced in February 2019 and May, June 2019 exam result of HSBTE 2019 likely to be announced on August 2019 respectively. However, HSBTE Result 2017 for November and December month examination always published in the month of February. of Government of Haryana. At present. HSBTE is offering more than 60 Diploma courses in the State of Haryana. The word Diploma includes Diploma/ Advance Diploma/ Post Diploma/ Certificate or any other Diploma with whatever nomenclature it may be called. HSBTE Result 2019: As soon as it is practicable, after completion of examinations and subsequent valuation, The board publish their Merit List or exam result online as well as sent to the respective institution. Publish Date of HSBTE Result 2019: The result of the examination shall be announced preferably within 8 to 10 weeks, of the completion of the Examination. A copy of the result notification shall be supplied to the Principals of the Institution concerned immediately. Detailed mark certificates shall be sent to the Institution preferably within 15 days of the declaration of results. (i) 33% marks in each of the theory paper. (ii) 40% marks in each practical examination. (iii) 40% marks in project work in each subject, if any. (iv) 40% (except Pharmacy) in sessional work (homework, tutorial Work, practical work and house examination, test taken together) in each subject. If a student failed to score minimum passing score or he/she not satisfied with their HSBTE result then the candidates may apply for Reappear process. The board will publish HSBTE Rechecking Result 2019 just after 30 days from the final result. The result of a candidate shall fall into one of the following grade categories. The grade categories are applicable as per teaching and examination scheme for a particular course. I DST (First Class with Distinction): Candidates passing in all subject heads and securing minimum 75% of total marks without any re-appear shall fall in this category. I (First Class): Candidates passing in all subject heads and securing minimum 60% or more but less than 75% of total marks shall fall in this category. II (Second Class): Candidates passing in all subject heads and securing minimum 50% or more but less than 60% of total marks shall fall in this category. Pass (Pass Class): Candidates passing in all subject heads and securing minimum 33% or more but less than 50% of total marks shall fall in this category. Results Held In Reserve (RHR), RLE (Result Late Due To Eligibility) The result of a candidate shall be held in reserve for want of any marks or information from the institutes and declared on obtaining such information as per the schedule of the Board. As soon as the result is published candidates may check Haryana State Board of Technical Education Examination Result for Nov Dec 2017 online. You may also follow the following steps to check hsbte result may 2019 and hsbte result June 2019. Now the result page will open select result for Nov, Dec or May, June month. Type Captcha Code as shown in the image. Finally, click on Search button. NB. Candidates may print or download HSBTE Nov Dec Exam Result for future reference. The HSBTE Result 2017 for November and December month examination likely to be announced on February. As matter of Fact, the Haryana Polytechnic Result 2017 will be published by the Haryana State Board of Technical Education (HSBTE). However, on the result publication day if any students unable to check hsbte result Nov 2017 and hsbte result dec 2017 due to heavy load on the main server. 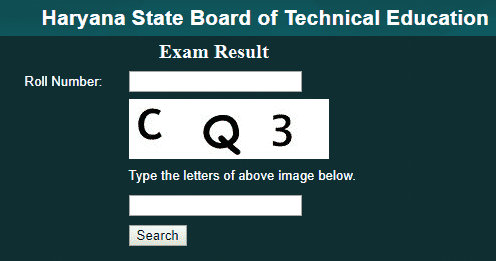 Please make a comment here with your roll number, we will bring your hsbte result 2019.